Diversity Arrays Technology (DArT - www.diversityarrays.com) is a micro-array based DNA marker technique for genome wide discovery and genotyping of genetic variation. DArT potentially allows simultaneous scoring of thousands of restriction site polymorphisms between genotypes and does not require DNA sequence information or site specific oligonucleotides. An international consortium (Australia, USA, UK, Slovenia) screened 86 (cultivated, wild; female, male) accessions of hop from Europe, North America, Asia and Australia, including examples of Humulus lupulus var. lupuloides, H. lupulus var. pubescens and H. lupulus var. neomexicanus, using DArT. The accessions included key current and historical, high and low alpha-acid, aroma, triploid, dwarf, and powdery and downy mildew resistant and susceptible cultivars. DArT identified 730 polymorphic markers, with reproducibility approaching 100%, and a high call rate. Preliminary studies of the data indicate that a large proportion of the markers reflect differences between wild and cultivated material. Distinction can be made between and within material of European, North American and Asian origin, with related accessions, and accessions from a single cultivar known by several synonyms clustering together. 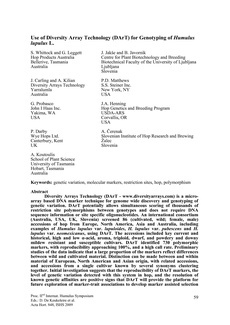 Initial investigation suggests that the reproducibility of DArT markers, the level of genetic variation detected with this system in hop, and the resolution of known genetic affinities are positive signs that DArT will provide the platform for future exploration of marker-trait associations to develop marker assisted selection technologies in hop. Based on this study, the DArT platform provides a reproducible, accurate, high throughput genotyping tool for hop. In the future this work will be developed to increase the number of markers available for hop using DArT, and to generate linkage maps and identify quantitative trait loci for key traits in a number of families.